Trailhead and parking area are on Dorchester Road in Lyme, NH. Dorchester Road leaves to the east from the center of Lyme. The parking area is on the north side, 4.7 miles down the road. Make sure to bear left to stay on this road at 3 miles, when it turns to dirt and the Dartmouth Skiway entrance is on the right. 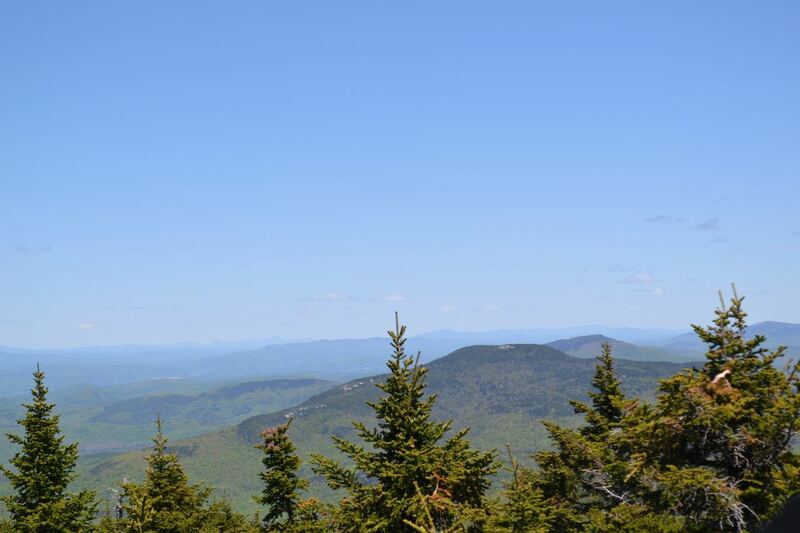 Smarts Mountain is a huge, forested mass which is the highest point in the long chain of peaks known as the Middle Connecticut River Mountains. Its summit bears a recently renovated fire tower which provides an excellent vista in all directions. This page describes a loop hike which ascends the scenic, ledgy Lambert Ridge and descends the less exciting but easier Ranger Trail. Leave the left side of the parking area on the Lambert Ridge Trail, which wastes no time climbing the steep south slope of the ridge. There are many switchbacks as the path climbs through the open, bouldery forest. After a short climb, the trail reaches the first open areas on the ridge. It passes through some brushy areas, then goes by a viewpoint of the ski slopes on Dartmouth Skiway. At 0.8 miles, the trail reaches the best viewpoint on Lambert Ridge, a lengthy rock ledge with views out to hills and ponds to the east and south. You can also see Mt. Cardigan from here. The trail ascends another pitch past the ledge, then crosses a flat area before climbing again. There are alternating sections of beautiful forest and scenic ledges, some with views and some without, as the trail climbs to the first high point on the ridge in 0.6 miles from the best ledge. A minor forest descent follows before the trail gets up to the highest point, crossing more ledges on the way, 0.4 miles from the first peak. One ledge here faces toward the main mass of Smarts, which appears quite distant. Look closely for the fire tower. Past the ridge highpoint, you must drop 200 feet over 0.5 miles to the wide and dark low point between Lambert Ridge and the mountain. A thousand vertical feet remain between here and the summit. The trail begins the climb very gradually at first; for the next 0.7 miles, there is little climbing and some descending. Then, the climb begins, increasing in grade for the next 0.3 miles. At this point, Lambert Ridge Trail joins with Ranger Trail. You will return to this intersection and descend on Ranger Trail. Continue ahead as the trail continues to become more difficult. During the next half mile, there are some difficult rocky sections, including one with a wooden staircase and iron rungs. The trail uses switchbacks to attack the steep west slope. In the upper sections, the trail winds through a grassy, eroded section. After the half mile, the trail reaches the edge of the huge plateau atop the mountain. Turn right onto a short spur trail to see a limited view to the south from a camp clearing. The main trail continues nearly flat for another 0.1 miles to the fire tower at the summit. There are excellent views across the broad top of the mountain from the tower. Views to the south extend a great distance, and you can see the trio of Mt. Cardigan, Ragged Mountain, and Mt. Kearsarge. Also notable is the view of nearby Mt. Cube. The most exciting aspect is of course the view of the White Mountains. Some of the closer hills block some of them from view, but this is an unusual angled perspective of the Whites. Mt. Washington is in clear view. Mt. Moosilauke, the closest of the Whites, looks impressive. To descend on the loop, return to the junction with Ranger Trail and follow that trail. This trail was constructed from the former fire warden's route to the tower. The first section away from the junction remains rough, but the trail eases as you descend further along. After 0.7 uneventful miles, the trail crosses a brook and becomes much easier. In 0.4 miles further, the trail crosses a larger stream, Grant Brook, and passes a former garage. The trail continues at a distance from the brook for 0.7 miles, then returns to parallel it closer. Some sections can get muddy at times. After 0.3 miles in close proximity to Grant Brook, the trail angles away and descends the last easy 0.9 miles back to the parking area.